Every year an increasing amount of national and international students, arrive in The Hague excitedly to begin their university careers. This puts an immeasurable pressure on the housing market and unfortunately, because of the shortage in available, suitable housing for students. As a result, not all incoming prospect students are able to start their university lives as they would want to. Countless students have to commute in the first few months. In worst-case scenarios, some have to quit their studies because commuting is not an option, something most prominent within international students. We, at Accommodent would anticipate this pressure on all future students of The Hague by easing the process and providing a multilingual platform, which would help find suitable housing options easier than ever. We will gather all housing options together in one place making it possible to find anything that suits the users’ requirements and expectations: from studios to shared rooms, and from on-campus to off-campus locations. Furthermore, we will include general information on all available housing websites, tips on how to best deal with certain issues and essentially provide prospective students with a “how to” guide with regards to accommodation in The Hague. Have you ever had housing issues? Do you know someone who has had housing issues? Has a child of yours experienced a tough time finding suitable options right after arrival? Do you need more information? Do you need more accessibility to suitable housing? Do you want to give yourself, prospective and current students their best chance? Do you want to help students to have an anxious-free and relaxed start to their studies? If you answered any of these questions with yes, then please take a second and donate a small sum for our start-up so nobody has to answer yes to any of these questions in the future. The contribution will go to making a fully functioning website. You have the power and we need your help! Are you interested in collaborating with us or do you have any tips or recommendations for our project? Our team consists of four students, motivated to make the life of a freshman easier. Ines’ ambitions are to create a successful and meaningful impact on a local scale so it can be beneficial to students in The Hague. Furthermore, she establishes communication and points of contact with various stakeholders, experts, which can further the project, provides new ideas and expands the communication network. Balázs’ ambitions could be most precisely described around practicality, efficiency and progress. He can be rather a sceptic when it comes to excessively ambitious projects in which he does not believe. He is always trying to stay on realistic grounds and propose ideas, solutions and approach issues from an angle that he believes are viable and feasible. Regarding his role within the group, he has been managing the visual elements and media related elements such as the video. 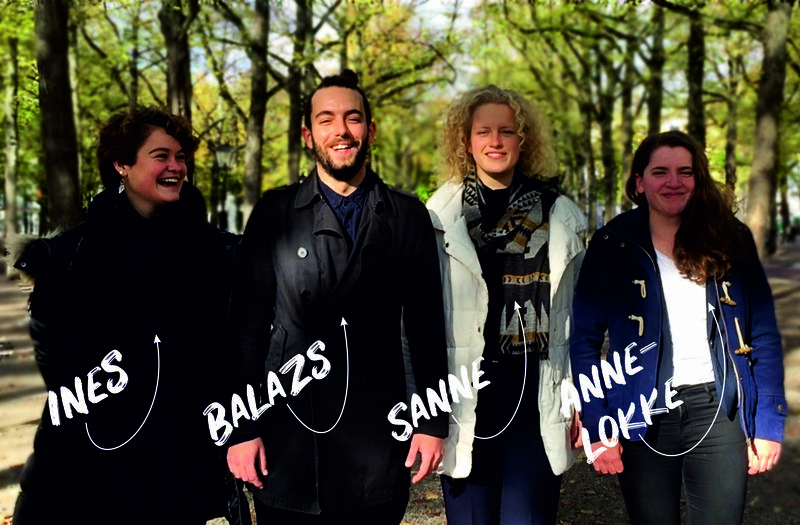 Next, we have Sanne, a political science student who thinks creatively about new ideas and solutions. ‘Experience is the best teacher’ is her motto and that is why she wants to go out there and start making this project work. Her goal is to produce a successful service where she and her group can make a real impact in the local society. Anne-Lokke is a student at the Technical University of Delft. Due to this, she is the most technical thinker of our group. Instead of thinking about a problem from a psychological perspective, she approaches problems in a fact-based fashion, bringing new insights into problems.